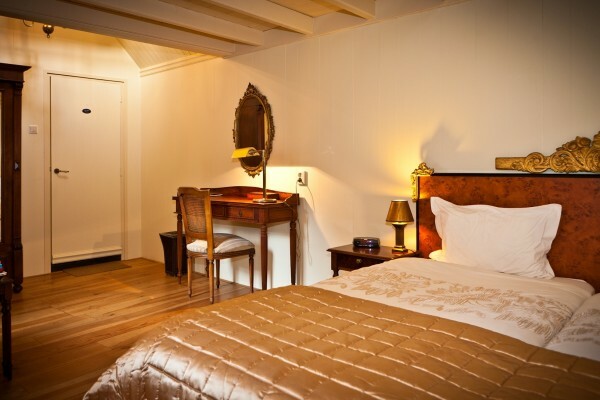 Our attractive guest room and luxury guest apartment offer you an ideal base for both a visit to Amsterdam and an exploration of the surroundings. 't Zaanse Koopmanshuis Anno 1694 is a 6-minute walk from Koog-Zaandijk railway station, with a direct link to Amsterdam Centraal railway station in the city centre (15). Free parking along the street. Our region, the Zaanstreek, offers a unique combination of water, wind and pastures, scenic beauty and factory odours, 17th Century wooden houses, churches, stately 19th Century merchant's houses and award-winning contemporary architecture, and rich heritage of windmills and industrial monuments. Moreover, the other attractions of the Province of Noord-Holland, with its dunes, beaches, polders, waterways and former Zuiderzee towns, are all within easy reach. Attractive, luxurious guest suite (about 40 m2) opens onto a large, peaceful, enclosed garden. The living room/bedroom has two single beds which can also be pushed together (extra bed and two extra beds for children available on request), a sitting area with comfortable armchairs, television, DVD, radio and CD player, and a personal Internet connection. The kitchen-diner includes an electric hob, refrigerator and microwave, pots and pans, and crockery. 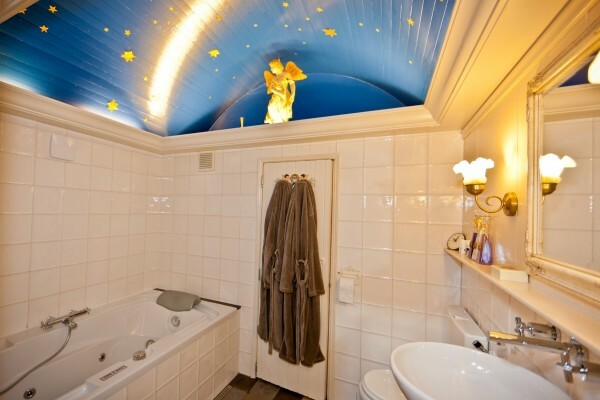 The romantic bathroom has a domed starry ceiling, a luxurious twin spa/whirlpool complete with bathrobes, and a large (reclining) sauna. Washingmachine and dryer, linens en towels. The apartment has a personal entrance via the garden, and a personal patio. The price of the apartment is € 135 a night for two persons ncluding breakfast. The surcharge for a one-night stay is € 10. You can hire cycles from us for € 5 per day, together with route maps. We can also supply picnic baskets on request. THe owners, Fred and Kelly, were outstanding hosts. I would stay at their Inn again without hesitation, and can highly recommend it to anyone. There were 5 of us in our party, and rented out the entire Inn. We had such nice conversations with our hosts, and they had bicycles waiting for us when we arrived so that we could cycle around the area (through windmill country) ... gorgeous. The food they provided for us was the highlight, for me at least. The garden and outdoor dining ... the quaint rooms ... the historic value of the Inn ... the hosts .. all made for a fantastic introduction to the Netherlands. A quick train ride took us to Amsterdam .. very easy to maneouver. Did you stay in 't Zaanse Koopmanshuis Anno 1694? Let us know what you thought about it and help others to make the right choice! * I confirm having stayed in 't Zaanse Koopmanshuis Anno 1694. Find other bed & breakfasts in Zaanstad or all bed & breakfasts in North Holland.